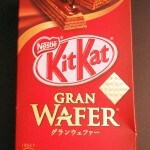 Review: Kit Kat Gran Wafer | Oyatsu Break! The answer of course is yes. It is always yes. The awesome person is Jocelyne Allen, and you can read more about her at her literary review website http://brainvsbook.wordpress.com/ (lots of manga and Japanese culture there too!). 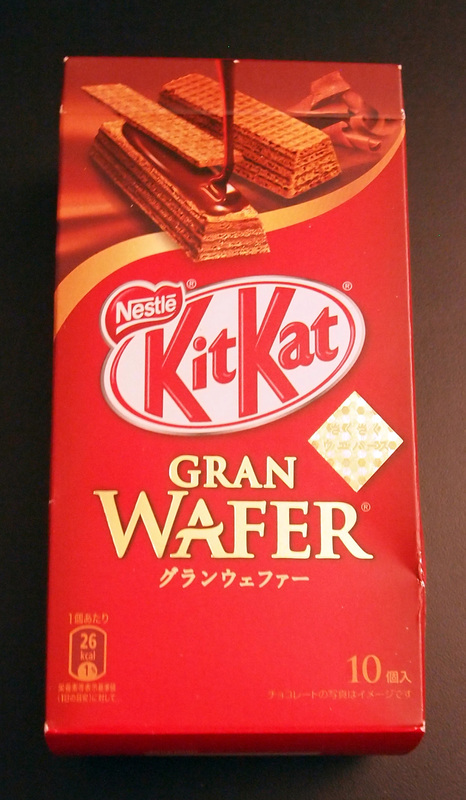 I didn’t see Gran Wafer very often on my November trip, but it was notably found on the top shelf, with only one or two boxes remaining at any given time. Good placement for this product, I think. 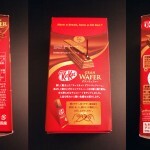 Packaging: Released in special packaging that recalls some of the stranger and more upscale flavours such as “Cheese” and the ‘Air-In’ Kit Kats, the Gran Wafer box is a pretty remarkable piece of packaging, and is probably the most ornate yet. 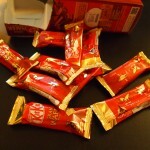 Consisting of a fairly large box with 10 single-stick individually wrapped Kit Kats, the package’s fairly prominent mention of only 26 calories identifies this snack as being for the calorie-conscious eater. 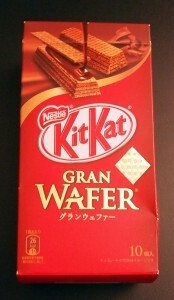 In addition, “Gran Wafer” is spelled out on the box in romaji (English), with a katakana translation underneath, and prominent English packaging is a general hallmark of “modern and sophisticated” in candy packaging design. 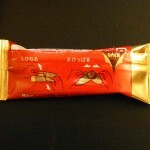 The printing on the packaging is simply phenomenal, possibly the nicest I’ve seen for a mass-market snack. 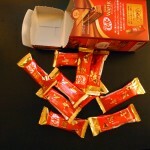 Extremely hi-resolution images of the Kit Kats are printed with a matte finish on four sides giving a luxurious feel, and every side of the box features spot gloss accents on the Kit Kat logo and the product image, making it pop! But if you want your product to leap off of the shelves, you need foil stamping, and the GRAN WAFER logo is stamped with a standard gold foil too, which would be the height of luxury… if there weren’t another type of foil stamping on the box as well! Yes the intricately-patterned textured gold foil diamond on this box pushes it over the top, as the fold foil diamond seems to exist simply to extol the surprising crunchiness of this product. Amazing. 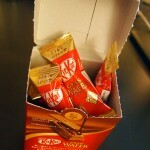 The box then opens from the back, and up, and is nominally resealable indicating that this is not a single-serving portion of Kit Kat, much like the treasure-chest themed ‘cheese kit kat’ container. The back of the box then contains still more glamour (heh), as we learn that this Kit Kat featured an entirely new way of opening your Kit Kat packaging, involving snapping the package apart at the middle. 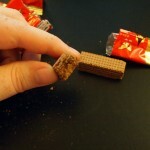 I’ve written 3 paragraphs about this before I got to the actual Kit Kat. Can you tell I was impressed? 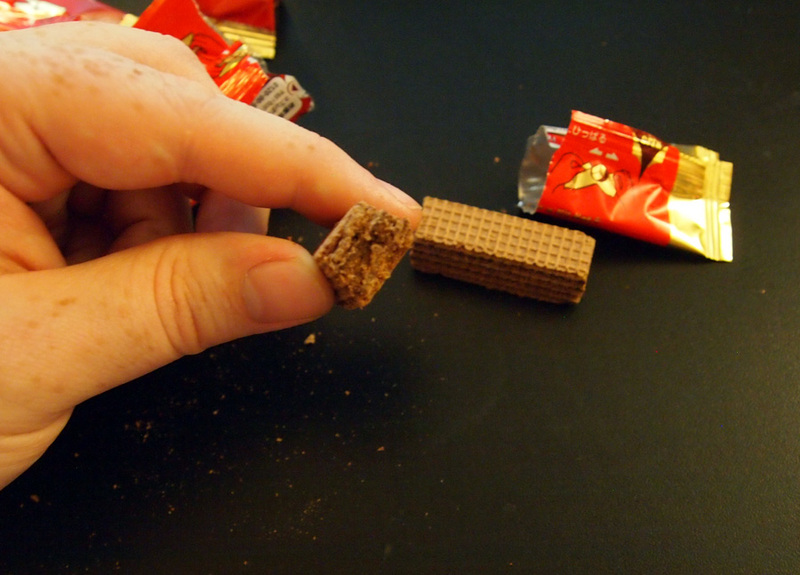 So, we’re finally greeted with a single Kit Kat stick, wrapped in a shiny gold foil package (complete with the “Wow it’s Crunchy!” diamond), and pictographic instructions printed on the back detailing how to open these new Kit Kats. Step 1: “hineru” or twist. Step 2: “hibbaru” or pull informally. Seriously Google translate said “informal pull” which is awesome. Anyway, maybe I am a dullard, but despite direct instructions it took me 3 or 4 tried to actually get the pulling-apart correct. There are apparently micro-perforations that make it easy to twist and tear the packaging, but if you don’t find one of those, well, you may freak out a little. Anyway, we’re all good now, I’ve become a master at getting into these new Kit Kats, so I can tell you what they’re all about…! 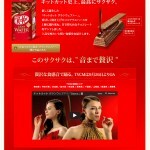 Scent and Taste: The strongest scent is of cocoa, which is a first in my Kit Kat experience. Even the “mature” dark chocolate Kit Kats didn’t have a scent that reminded me of straight-up hot cocoa, and this does. It’s really pleasant. This is a unique Kit Kat in that it’s the first I’ve ever tried without an outer shell of chocolate. 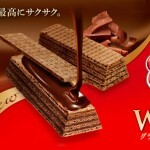 It’s just wafers held together by a chocolate filling, and so my first thought was that the texture was wrong. I mean, not ‘wrong’ wrong, just, not a Kit Kat. It’s like the cheap wafer-cookies that you’d get at the supermarket. 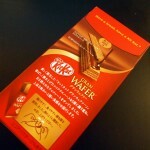 That surprise was followed by another—the wafers here are chocolate flavoured and coloured chocolate brown, which is another Kit Kat first for me as usually the wafers are just a standard sort of ‘cookie’ flavour, though honestly they have almost no flavour at all. These tasted alright, not spectacular, but it was nice to get a little something extra. All this before the first bite. And that first bite? Excellent. It continued the cocoa flavours I’d smelled, and was really rich and delicious. 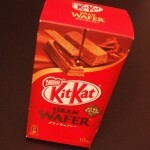 Better still, it wasn’t even close to as sweet as your average Kit Kat, perhaps even less sweet than the “Adult” bars. The bar is also much denser than your average Kit Kat—delivering on its promise of surprising crunchiness, sure, but also delivering a surprisingly satisfying little bite. Verdict: This is a real success, and it shows that Nestle are finally spreading their wings a little after playing it safe for a few years. This is a mature, complicated flavour, featuring unique textures and with quality, tasty ingredients. I honestly didn’t have high hopes after being so disappointed with their other calorie-conscious offerings, but this was pretty great. It could be argued that chocolate is a safe choice, and a variation on chocolate will be an easy sale… and that’s totally fair. This isn’t going to blow anyone’s mind the way that Pancake Kit Kats did, for example, but this is a pretty big departure for the standard Kit Kat, and I’m pretty excited about it. Thanks Nestle!